HOW TO SUPPORT THE 'CINEMA DU DESERT' PROJECT? This project has two hearts: the first one goes to our dedicated volunteers. And the next treats must be towards our vehicles that need a lot of care to survive the toughest roads to reach the most unexpected places. 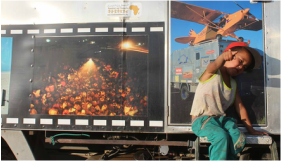 The truck is key, not only to deliver materials and carrying the mobile cinema, but it also allows us to keep our living expenses very low, creating a true "home on the road" for our volunteers. No hotel rooms, no restaurants, etc... the truck is equipped with a 300l water tank, a solar powered energetic rig, a functioning kitchen, a functioning toilet and sleeping areas. We make use of our D.I.Y. expertise to built and refurbish the inside of the truck "box" ourselves. Saving a lot of money; creating the necessary accommodation for the volunteers; being energetically independent (only using 'clean' energy to make our cinema possible) and having a large loading space available for the necessary equipment (projectors, film screens, inflatable castle and sound systems). Also essential is to make sure the truck is prepared for the arduous journey: filled with spare equipment, medical supplies, good tires and a professional 'check-up' before leaving on the mission. In questo momento non sono attive campagne di raccolta fondi on-line. There are no active crowdfunding campaigns now. It's possible to donate with Pay Pal. 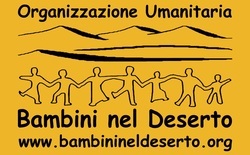 The account is linked to the Bambini Nel Deserto's NGO bank account. For transparency sake, every year the list of all expenses for every project is available on-line, including those from 'Cinema du Desert'. Check out BnD's donation web-page! Are you interested in partnership/sponsor? We are offering different options for companies or private entrepreneurs who wish to sponsor/partner with us. Check them out here. ﻿"Few are willing to sacrifice short-term economic supremacy for long-term sustainability"
If you like to use or share any of our photos or videos just email us please. Thank you!